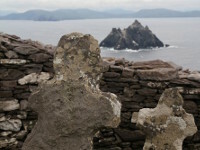 County Kerry (the fifth-largest county) is situated in the south-west of Ireland and is one of the most visited regions of the country. 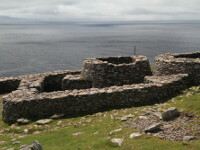 Southern part of the county Kerry consists of three mountainous peninsulas of Beara, Iveragh and Dingle. 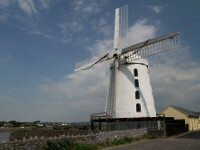 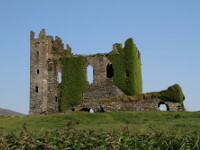 The northern part is a undulating plain stretching to the Shannon Bay. 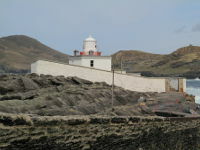 Beara Peninsula - only a small, north-western part, belongs to the county Kerry, the rest of the peninsula belongs to the county Cork. 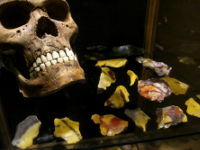 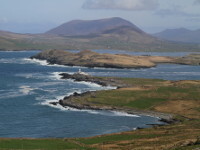 It's mountainous peninsula with jagged, rocky, coastline typical for west county Cork region. 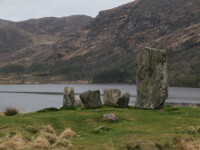 The scenic "Ring of Beara" (almost 200 km long circular tourist route for cars) which starts in Kenmare gives great views around peninsula. 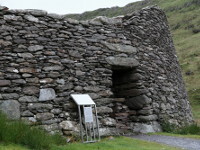 For hiking enthusiasts, there is The Beara Way - long distance waymarked trail (206 km or 128 mile), with a large concentration of historical and archaeological sites. 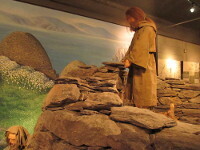 Iveragh Peninsula contains highest mountain range (MacGillycuddy's Reeks) which includes 9 of 10 the highest peaks of Ireland (Carrauntoohil is the highest one - it's 1,038 metres or 3,406 ft). 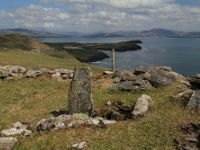 A great way to explore the Iveragh Peninsula, is to follow The Kerry Way, one of the longest (214 km) and also one of the most popular marked hiking trails in Ireland. 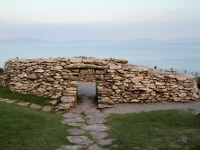 An alternative way to explore peninsula is to drive through the Ring of Kerry, which is a almost 180 km long, circular tourist route. 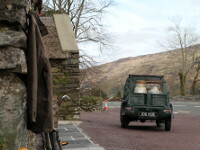 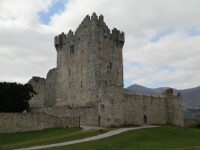 Both, the Kerry Way and the Ring of Kerry begins and ends in the town of Killarney , which is very popular travel destination and offers accomodation, great food and local folk music. 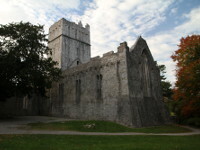 The main reason why so many tourists visit Killarney is undoubtedly the surrounding landscape. 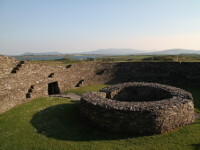 There are three beautiful lakes (Lough Leane - Lower Lake, Muckross Lake - Middle Lake and Upper Lake), a huge and wonderful Killarney National Park and Torc Mountain with famous Torc Waterfall (18m high). 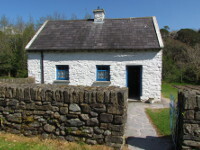 Approximately 17 km from town of Killarney in Kenmare direction (road N71) there is viewing point called "Ladie's View" from where you can enjoy the stunning views of Upper Lake, Gap of Dunloe and Black Valley. 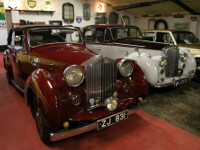 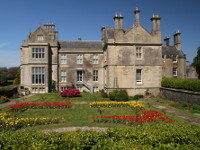 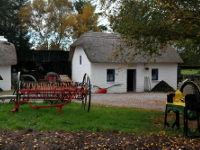 There are also a few notable historic sites within the town of Killarney like Ross Castle, Muckross Abbey and Muckross House (19th century mansion house) with magnificent Muckross Gardens. 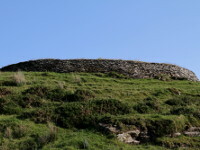 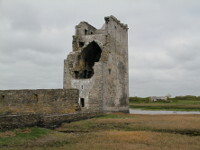 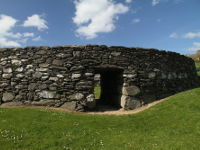 There are also a few interesting historic buildings scattered across Iveragh Peninsula like Staigue Fort, Cahergall Stone Fort, Leacanabuaile Stone Fort or Ballycarbery Castle. 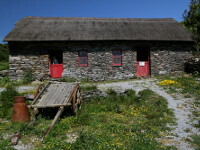 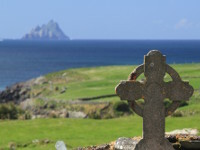 Not so far from the western end of the peninsula are situated very popular islands: Skellig Islands (renowned for its scenery, sea bird colonies, long-lived lighthouse service and Early Christian Monastery - recorded in UNESCO) and Valentia Island which is connected with the land by the bridge. 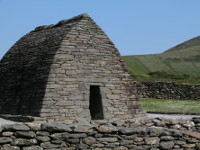 The Dingle Peninsula has something to offer to everyone: mountains with second highest peak in Ireland (Mount Brandon - 952 m or 3123 ft); sandy beaches like Inch Beach, Fahamore Beach and Ventry Beach; high concentration of ancient sites (Dunbeg Promontory Fort, Gallarus Oratory, Fahan - collection of drystone beehive huts). 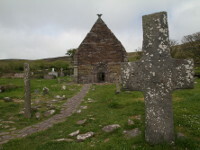 Visiting Dingle Peninsula don't miss the Connor Pass - the highest mountain pass and also one of the most scenic roads in Ireland, especially popular among cyclists. 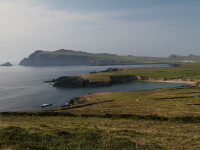 To the west of Slea Head is situated Blasket Islands Archipelago which is popular travell destination for wildlife enthusiasts.